The Teeter EP 550 Inversion Table incorporates our newest technologies to achieve maximum stretching and decompression, for reduced back pain and muscle relaxation. The patented Ergonomic Flex technology provides a greater range of motion, while encouraging realignment and muscle relaxation. A smooth, injection-molded surface reduces friction for optimum decompression and the foot platform design dials up or down for a secure & comfortable fit. Whether you want to enjoy better posture, reduce back pain, or simply minimize your daily stress load, the Teeter Hang Ups EP-550 inversion therapy table makes a terrific choice. Inversion therapy works by placing your body in line with the downward force of gravity. In the process, inversion elongates the spine, increases the space between the vertebrae, and relieves the pressure on discs, ligaments, and nerve roots. And less pressure means less back pain, as well as fewer headaches and neck problems. Inversion is an ideal therapy for people with persistent spine and muscle problems, in addition to athletes who frequently push their body out of whack through repetitive muscle motions, such as runners, weightlifters, skiers, bikers, and golfers. Studies suggest that inverting yourself a mere 25 degrees for even a few minutes per day can have tremendously positive effects. 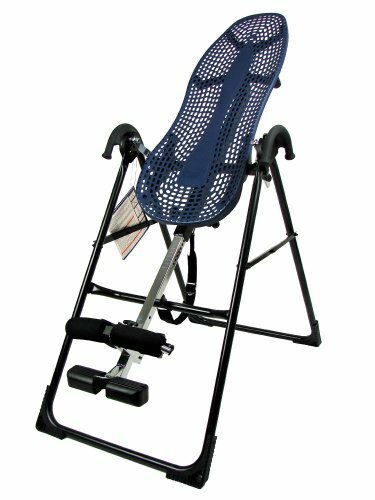 The EP-550 is outfitted with such features as Flex Technology, which allows the backrest to bend accommodate your stretches for greater mobility and range of motion; an adjustable foot platform with two settings, allowing you to find the optimum position for ankle comfort and security; and an EZ Angle tether strap, which offers preset angles at 20, 40, and 60 degrees, along with custom angles depending on your preferred position. Other details include an adjustable head pillow for maximum comfort, an instructional DVD, and a 300-pound user capacity. The EP-550, which accommodates people as tall as 6 feet 6 inches, carries a five-year warranty. Roger and Jennifer Teeter founded Hang Ups Inversion Products in 1981 and have been dedicated to manufacturing quality inversion products ever since. Roger and Jenny truly believe in the benefits of this simple, natural form of therapy that has been around since 400 BC. In the late 1970's, Roger tried many forms of therapy to help manage his pain. He finally discovered that by inverting, he was able to relieve his back pain and begin the road to recovery. He credits inversion for keeping him pain free, healthy, and active. Inversion has changed Roger's life, and now he is dedicated to sharing his knowledge of inversion and quality products. STL International, creator of Teeter Hang Ups brand inversion equipment, has pioneered standards for quality and performance in the inversion market. All Teeter Hang Ups F-series inversion tables are classified in accordance with UL 2601-1 (medical equipment in a clinical setting), a rigid specification that tests the structural integrity of the equipment. Great product! Great price! Great relief!!! In summary, my lower back is now manageable without medication. I really tried physical therapy, chiropractic, muscle relaxants, moist heat, pain medications, and acupuncture with no success. Using this table my back pain is greatly diminished and it's like I got my life back again. The quality of this table is excellent and what more can you say when you have success. Despite the medical warnings that inversion tables are not recommended for those with prior back surgeries, inserted pins, etc. I purchased the EP-550 and the boot accessory kit. I have disc and joint disease. I am 46 years old and in the past six years, I have had eight orthopedic surgeries, including rods and screws in my lower back, my second disc removal from my neck, three shoulder surgeries, elbow surgery, rotor cuff surgery and the repair of a 40% bicep repair. Lately, I have had a lot of stiffness and pain in my neck again and my hips have been acting up. In an effort to hopefully delay another neck surgery, and take pressure off of my hips without surgery, I figured I would give the Teeter hang up a chance. I have had the teeter for two weeks and here are my thoughts. First, I like the ability to hang upside down to let my arms extend down and provide some natural stretching to my surgically repaired shoulders. It machines works well for that purpose. Also, my hips do feel better in that they seem to stay aligned better and keeps the pressure off when standing. When inverted, I do feel the stress of the pull on the rods and pins in my back at waist level. While saying that, I want to point out that it is not a matter of causing pain, just the pressure of the weight of my body hanging from the pins. What works best for me at this point is that I first warm up by slowly tetter totting up and down, to put the stretching pressure on and then off again, etc. This is also somewhat enjoyable as well. On a side note, I put my wife on this teeter for the first time yesterday and she also tetter tottered as well and laughed the entire time. My daughters love the machine. Anyway, once I warm up by tetter totting, I hang completed inverted and then do slow turning stretches. Yesterday I started to incorporate a few crunches into my routine. I let myself get about 30 pounds over weight during the past few years of repeated surgeries but I am hoping this machine will help my joints feel better so I can work out more. So far, I have had no ill effects from this machine and my shoulders and hips feel better. My neck is still stiff, but they already told me I need another surgery for that. One comment on the adapter and boots. I purchased them because I saw the comments of others that the non boot option was not to comfortable. According to everyone on my family, the boot option is not all that comfortable either. Perhaps I am making them too tight for my family while I gain confidence in the safety of the boots but all find the boots uncomfortable after a few minutes of inversion and some lose of sensation in their feet for a few minutes after being off the machine. The teeter totting seems to reduce this discomfort somewhat with the alternative pressures. I am giving this a four star as the boot adapter seems to force my feet too close together as to somewhat crunch my hips while on the table. I am sure you are tired of reading my post but I just wanted to share thoughts of one who has a ton of the medical issues they say users of this machine should avoid. This is a great product for your back, however, be aware that you may injure yourself unknowingly if you've had hernia surgery. I had surgery 2-1/2 years ago and after using the Teeter Hang Ups for about a week, doing the swinging motions they suggest, I started to experience sharp pain at the site of my hernia. I went back to my surgeon who said that the hernia repair was still in place, but I had likely pulled out some of the permanent stitches by stretching my mid-section, and it would take time for the pain to go away. There is a warning in the manual that says "do not use if you have hernia" but it is in fine print, and I assumed that a "repaired" hernia would be OK. Shipping box arrived all beat up with missing parts. The Teeter company did fill first request for missing parts, but their package was itself missing a part. The assembly instructions leave a lot to be desired - hard to follow, poor illustrations. back feels great after I get off of it. The Teeter Hang Up works well and is very well built. I have been using it daily for about 3 weeks now and my back feels great. A great tool to help your back and health. My mother has had one of the these for years, and when I visit I do some hanging around. My chiropractor encouraged me to get one and told me mother knows best! I got this newer model and have really enjoyed it. The box is quite heavy, but that is a good thing because you know it is sturdy. It does not take long to put together and the instructions are simple. This is a high quality inversion table. It is very solid and easy to assemble. I am pretty large - 6'2", 260 lbs. I feel very secure on this even in the fully inverted position. Buying an inversion table is something that I had considered for quite awhile. I had heard from several people that they are very helpful for back problems. Although I do not have chronic back issues, there are times when I have lower back pain. Using this has been very helpful for me. It really seems to decompress my back, which may be quite helpful for those who sit at a desk for countless hours each day. I have not had any issues with my back since shortly after starting to use this. Generally I invert for about 10 minutes, 4-5 times per week. The Teeter tables are all sort of expensive but I am happy with the purchase. I think that if you are going to hang by your feet you should want to do it as safe and secure as well as comfortable as possible. This table just feels solid whether you are just at an angle or if you go with the full inversion. I have to admit that for me it took a few times to get used to the inverted sensation but I also had never done it before. If I had to point out a drawback I find that the method for holding the feet is not perfect. I like to go fully inverted and it is not the most comfortable on the feet/ankles. Part of that is that I had a broken foot not that long ago and theres a big pad that goes right across the foot and that doesnt feel too great on a foot that is still somewhat sore. I do plan to get the conversion bar and use some of the gravity boots in order to make inverting more comfortable when I do it for longer periods of time. Assembly is not difficult at all I just read the instructions and went at it although the DVD that comes with it has a part covering assembly that might explain it better than the instructions did. I would say that unpacking the item from the box was more of a challenge than assembly. I'm very happy with the Teeter EP-550. The product is made very well at it's easy to use. This is my first try at an inversion table and I feel very secure on it. After about 30 minutes assmebly time, the table was ready to try. I tried it without viewing the video first, as I was anxious to see if I would notice any relief after just a couple of minutes. I was pleasantly surprised. After just 2 minutes, not even fully inverted, I could feel the compression in my lower back disipate. I then watched the video and realized I had not set the foot bar or the table position where they needed to be, based on my weight & height. Once I did that, and saw the "proper" way to invert, I felt much more confident during the inversion process. It does feel strange at first... quite a head rush the first time... but you get used to it in just a couple of tries. I can now fully invert for a full 10 minutes. The video was very helpful with suggestions for exercises you can do as you are inverted. I don't use it every day. I find if I use it every couple of days, that gives me the relief I need. I don't find that it is as long lasting a relief as doing yoga, daily. But for a quick fix it's great! I even inverted one day for 5 minutes, before I helped my husband move a 32 inch "old style" TV set from the floor to a TV stand and my back held fine. I'm sure if I hadn't stretched it out first, I'd still be in pain. Excellent results for the last year! I have owned the EP-850 model for more than a year now. I had lower back pain with the sciatica causing pain and numbness down to my toes. I also had a bulging disk irritated by lying on a table for 40 minutes to get an MRI. The pain was so bad I couldnt lay down or stand up. The pain was unbearable. I noticed a huge improvement after using the inversion table 3 times the first day for only 2-3 minutes. I also had a problem where as I walked my back would "lock-up" for a second or two stopping me in my tracks. It happened many times a day. After the first day this problem went away completely, never to return. I used the table 2-3 times a day for a month and now only use it once a day for maintenance. I also go fully inverted and do sit-ups. I have not had any pain in my back that's worth mentioning in more than a year. If I do something that puts a lot of stress on my back which causes very mild pain, I invert a few times and it's gone. I do go to the chiropractor once every six months or so mainly to get my neck adjusted. I don't think inversion puts enough weight on my neck to get the results like I get in my lower back. In the beginning the doctor had mentioned surgery. I am sure glad I didn't go down that path. I have recommended the Teeter Hang-up to many friends. I got the EP-850 on [...] because they didn't offer the mesh backing a year ago except on [...]. I still don't see the EP-850 offered anywhere else. I like the larger handles on the 850. It has a very stable platform and I have used it without shoes (I know) and did not feel discomfort. Awesome Product for a damaged back!